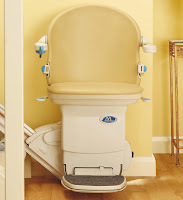 Castle Comfort Stairlifts offers top brand stairlifts, keen prices and fast installs for all those seeking stairlifts in Mansfield, Nottinghamshire. And all work comes with our no-quibble guarantees and famous customer service satisfaction. Give us a call today on 0115 971 7012 If however, you are looking for fascinating facts about the area then feel free to read on. Welcome to Mansfield in Nottinghamshire, just 15 miles north of the city of Nottingham and closer to Sherwood Forest as it exists now than Nottingham. Mansfield’s retired population is around the 13,000 mark with probably around 350 of these owning stairlifts. These facts are gathered from the national averages which Castle Comfort Stair Lifts keep track of on their homepage counter. Of course it isn’t only the old who need stairlifts; others who have been injured or suffer from some form of disability which prevents them manoeuvring the stairs successfully may also require the help of a stairlift. If you or a loved one finds yourself in one of these positions please give us a call on 0115 971 7012 ; we can advise and assess and give you some fair stairlift prices. Lord Byron the 6th Baron Byron lived for a short period at nearby Newstead Abbey in Ravenshead which he had inherited. Byron is considered one of the best English poets and is still well read today. He’s also revered as a Greek national hero as he made a pilgrimage to fight in the Greek War of Independence against the Ottoman Empire. In his day he was better known for his ‘aristocratic excesses’ i.e. huge debts, many love affairs and rumours about an incestuous affair with his half-sister Augusta. 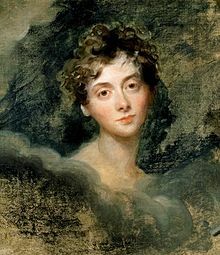 His famous mistress Lady Caroline Lamb described him as ‘mad, bad and dangerous to know’. Speculation has suggested he may have suffered from Bipolar disease. He died young at 36 in Greece. Roman coins and a villa have been discovered in the area making the general consideration that the settlement at Mansfield dates back to these times. By the 6th and 7th centuries nearby Sherwood Forest was used as a hunting base for the Mercian kings. It is mentioned in the Domesday Book with much of the forested land remaining the property of the Royal Household. Farming took hold in the 18th century and with the development of the railways and industry in the 19th century, Mansfield really began to grow. Coal and cotton production were its big products but it was also the home of the hosiery industry. In 1800, 700 hand frames were installed in homes for the ‘stockingers’ to produce hosiery. By the end of the 19th century as machinery became mechanised more than 1,000 people worked making stockings in Mansfield with more than 2,000 in nearby Sutton-in-Ashby. The proportion of women employed in this work was 7:2. Cotton and silk were used to produce the hosiery and other goods such as underwear, gloves and ties. There has also been a history of boot and shoe making in the area at one time accounting for 600 local people employed by the industry. During the Second World War one factory produced a special line of thigh high boots for RAF pilots and observers. Of course hundreds of thousands of other boots and shoes were also made. Mansfield was also big on producing tin boxes with art printing. The boxes have been found all over the world and the firm responsible was granted several Royal Warrants; boxes containing chocolates were sent to troops in South Africa by Queen Victoria and all boxes produced to celebrate Edward VII’s Coronation were made here. In the Wars the factory was given over to produce munitions and began producing mechanical toys after the Second World War. Another of Mansfield’s main sources of industry over the last couple of centuries has been brewing beer at the Mansfield Brewery. One of their famous straplines in the 1980s used US President Ronald Reagan in their campaign. The tag line said, "He may be president of the most powerful nation on Earth but he's never had a pint of Mansfield". The brewery which had changed hands a couple of times last century finally stopped brewery and was demolished in 2008. Have you tasted a Mansfield? Not ready to be ‘shut down’? Get in touch with Castle Comfort Stair Lifts if you need some help getting mobilised. As agents for all UK manufactured stairlifts or chairlifts, we can give you unbiased advice about which one is best for you and your property. You might need a straight, a curved or even a perch stairlift if sitting down or bending your knees is difficult. We can come and see which one is right for you. Give us a call now on 0115 971 7012. We don’t expect to break any records in our stair lifts but we know they will improve the speed with which you reach the top or the bottom. They will also be safer too. 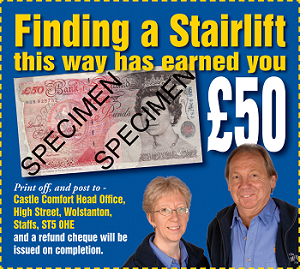 If you’d like to know more, take a look at our video about stairlifts; you can use our £50 voucher towards the cost of a stairlift or try for a grant or 0% finance. Whatever you do, give us a call to see how we can help. Once you have made a decision we can have a stairlift installed within an hour or at least half a day and our after sales service is speedy too! Please call us on 0115 971 7012 .